Psychic John Russell was filmed under the direction of multiple Emmy Award winning producer Jim Mullen for a TV pilot for The History Channel where John psychically investigated mysteries of the past, specifically the assassination of President Abraham Lincoln. In regard to John's TV pilot Jim Mullen said, "As a TV Producer, you have to be open minded about the unorthodox, while still retaining a healthy cynicism. After all, the last thing you want to do is pull one over on the viewer. 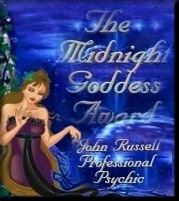 "A good psychic reader is hard to find, but I've found one...JOHN RUSSELL! "As a clairvoyant myself, I'm the world's biggest skeptic when it comes to practicing psychics. Too many of them are simply good b.s. artists. "JOHN RUSSELL is that rare person who has a genuine gift. "His reading included several very specific insights that turned out to be highly accurate. "A reading with John is more than just a look into the past, present and future--it's also a reassurance that there's a plan for your life, that you're not alone, and that the challenges you face can be embraced as learning experiences." I began to provide psychic readings professionally at the age of 18. For over 40 years now I have provided psychic readings—both in person and by phone—for a nationwide clientele, and for over 20 years I've become internationally known: I've read by phone for a worldwide clientele, having served clients in more than 30 countries. Your reading with me by phone will be every bit as accurate as an in-person reading with me; the reason is that a true psychic gift isn't restricted by the physical limitations of time, space, or distance that hamper normal communications. My readings have always been accompanied by three powerful hallmarks: accuracy, truthfulness, and ethics. Accuracy: no psychic on the planet is 100% accurate, but my readings, which include my insights, counseling, and predictions, have proven to be astonishingly accurate, many times flabbergasting my clients who told me during their readings that I had to be way off the mark, only to see my predictions for them come true! Don't be afraid of accurate predictions: if I foresee something negative I will also equip you with ways to avoid, if possible, or at least to minimize the event. Likewise if I foresee something positive I will help you to position yourself to get the most out of the event. In my experience I would estimate that a good 80% or more of our lives and therefore our futures are under our own control. For that percentage of your life I will give you helpful guidance as I'm directed by input from the Other Side, that is, the Spiritual Dimension and the many spiritual beings and intelligences from which I receive my insights, guidance, and predictions. Truthfulness: no psychic on the planet has all of the answers; if I'm not shown or I don't know I'll tell you; if I am shown I will tell you, but I will do so with truthfulness...I won't pander to you by telling you what you want to hear but I will tell you the truth. And then what you do with that truth is up to you. No psychic or spiritual leader, or friend, or lover, or spouse...no one on this planet can do for you what you need to accept responsibility for and do for yourself. But I can help you by providing you with helpful guidance from the Other Side and suggest tools that you can use to help change your life for the better, and even help you learn how to use those tools for maximum effect. Ethics: I will not lie to you; I will not lead you astray; I will not promise you things that I can't deliver. I will not lie to you: I don't know all of the reasons "why?" I don't know why your entire family prayed for a loved one's healing and they died while across town someone who had lain forgotten in a coma for years suddenly popped wide awake and sound of mind and resumed a happy and healthy life. I don't know what the true source of evil is, and I'm amazed at our collective inability to overcome it. I don't know exactly what life on the Other Side is like (and any psychic that tells you that they do is either lying or self-deceived). I don't have all of the answers to Life's greatest questions, but for over 40 years the Other Side has provided me with helpful and accurate insights, guidance, and predictions for my clients, and has allowed me to guide their lives toward better circumstances. That amazes me and brings me joy. I will not lead you astray: I don't have a secret or "insider" organization for you to join which will entitle you to special learning or secret knowledge; there's no such thing. I offer no special clothes or robes or costumes for you to buy and wear; no "blessed" prayer handerkerchiefs or any other such money-grubbing nonsense. I don't have any "special" or "sacred" or "blessed" jewelry for you to buy and wear. I don't have any books for you to purchase that promise to reveal the path of salvation to you or that will reveal Life's hidden secrets or that will help you to achieve your every goal and dream. And I don't offer to perform miraculous supernatural feats for you for large sums of money. Those who do such things are con artists and frauds, or they are severely misled themselves. I will not promise you things that I can't deliver: I can't make your cheating boyfriend behave himself and come back to you faithful forevermore. I can't promise that I'll help you get that raise or promotion or that special job that you want. I can't make your children act like little lambs or make your alcoholic girlfriend quit drinking or make your awful boss to quit acting like a jerk. And I can't deliver you from your negative circumstances no matter how much money you pay me; neither can anyone else, and anyone who says that they can is a liar, a fraud, and a cheat! They're out for your money...RUN the other way! Stay away from these frauds! What I will do is use my 40+ years experience and my solid connection with the Other Side to provide you with an authentic psychic reading delivered by authentic means...I never use computer or software-generated readings, automated devices, or any other types of gimmicks in my psychic readings, nor do I merely offer "by the book" interpretations. As the Other Side leads me and gives me information for you I will enlighten you as to the predictions they have for your future and the approximate timelines in which those events will occur, and tell you how to act and react appropriately to those events. Utilizing a variety of psychic gifts, tools, and techniques as well as listening to instruction from those on the Other Side I will provide you with insights, counsel, and guidance that will be helpful to you now and in your future if you will heed it and apply it. By adhering to these three hallmarks—accuracy; truthfulness; ethics—I have been privileged to serve thousands of clients over the years, with some of them becoming frequent repeat clients and maintaining relationships with me that have lasted decades or longer. I hope that I can likewise be of service to you. 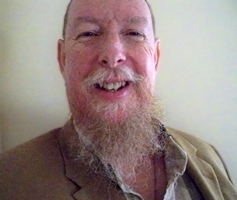 Please click on the links below to find out more about me and how I conduct my readings. 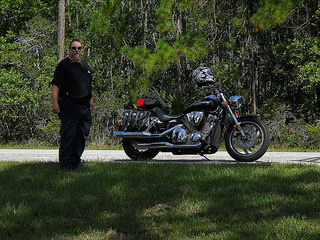 Riding my motorcycle thousands of miles has resulted in some compelling, sometimes spine-chilling paranormal experiences. My book of true ghost stories is complete and I'm seeking publication. Martha Lawrence said: "John Russell—a biker who happens to be a gifted psychic—takes readers on a thrilling ride off the beaten path in this new motorcycle memoir. Fascinating and well written, these thought-provoking recollections of true experiences offer inspiration and entertainment for believers and non-believers alike. "—Martha Lawrence, author of Pisces Rising and Trust Works! "John is a great counselor with an abnormally accurate insight for the future. When faced with uncertainty or challenging situations, regardless the topic, John can steer one in the right direction. His advice and predictions has always been spot-on." and he has appeared on several different stations both weekly and monthly for 8 consecutive years! After 13 years John is taking an extended break. Click Jay's photo to visit the station's site. "My first encounter with John was about 4 years ago when I was hosting a morning show in upstate NY. We were looking for a psychic for a monthly morning feature, but it turned into more than that. Our listeners immediately became comfortable with him and I was amazed at the accuracy of some of his short readings. John even came to our station a few times and once helped us raise money for a young man with leukemia. "I'm now at another radio station halfway across the country, but John is still a part of my show; I wouldn't have it any other way. I don't know much about psychics and I probably have a somewhat skeptical attitude toward most of them, but John has a gift. If you want some insight into your future, along with a little help on how to deal with it, ask John. And as I tell my listeners, if you don't want to know, don't ask!"